Install WAZER — WAZER | The First Desktop Waterjet. The Pump Box is shipped with a red Oil Cap that seals the oil chamber to ensure the Pump Box does not leak oil during transport. This red Oil Cap must be replaced with the yellow Pump Vent Cap prior to turning on the unit. [NOTICE] Running the unit with the red Oil Cap will damage the Pump Box, and this damage WILL NOT be covered under warranty. 1. Loosen (you DO NOT need to remove) the four fasteners that hold the cover on. You should be able to loosen these Pump Box Cover Knobs by hand. Two are located along the back edge and two on the bottom front edge. [NOTICE] DO NOT tilt the Pump Box backwards onto its water connections. 2. Remove the grey sheet metal cover by pulling the bottom front edge forward and top edge up. [WARNING] NEVER remove the grey cover while the Pump Box is connected to power or you could be electrocuted. 3. Remove the red Oil Cap with the provided 17 mm wrench and replace it with the yellow Pump Vent Cap found in the white box in the Setup Kit. Tighten the cap until it is finger tight and retain the plug for later shipping. 4. Replace the cover and tighten the Pump Box Cover Knobs so that the cover is securely fastened. Ensure that they are well-secured in order to prevent unwanted vibration. You will be required to replace the oil in the Pump Box every 300 hours of run time. For more information, see Maintenance > Pump Box Oil Change. To see the full required maintenance for the Pump Box, refer to Maintenance > Maintenance Schedule. Each hose is critical for operation. The Water Inlet Hose provides water for cutting. The Water Drain Hose disposes water. The High-Pressure Hose delivers high-pressure water from the Pump Box to WAZER. There are also several connections that cover other essential functions. The provided Plumbing Kit should be compatible with most home or commercial plumbing. If the supplied fittings are not sufficient, your local hardware store will have additional adapters and connectors. If you are uncomfortable with this part of the setup, have a professional plumber complete this part of the installation for you. [NOTICE] WAZER should never be configured to have its drain water recirculate into its Water Inlet Hose. This will destroy the Pump Box and void your warranty. We have provided a Push-to-Connect (“John Guest” style) system for both hoses. This system requires no tools to lock or unlock hosing from the fittings. To lock the hose into the fitting make sure the end of the hose is cleanly cut and push it into the fitting. When you push the hose into the connector you will feel some resistance. Push past this resistance to fully seat the hose. The resistance is from the fitting’s O-ring sealing around the hose. Don’t be afraid to push forcefully to ensure you have fully seated the hose into the fitting. To unlock the hose from the fitting, push the collet into the fitting and pull the hose out of the fitting (in the opposite direction). Again, this may take some force. The Water Inlet Hose needs to be connected to your water source at one end and to the Pump Box at the other end. 2. Connect Water Inlet Hose to Pump Box: In your Accessory Kit, you will find a Water Inlet Hose (3/8” diameter White Hose.) Connect this hose to the Water Inlet Connection on the rear of the Pump Box. Leave enough slack in the hose to be able to pull the Pump Box out, remove the cover, and access the rear if needed in the future. 3. Route Water Inlet Hose: Route the rest of the hose to your water source. We recommend routing along piping or at the base of a wall. Do not place the hose near items that could cause abrasion (i.e. bolts, sharp metal plates, etc.). Every installation will be different, but we recommend using zip ties and the provided hose routing anchors to help with tidy routing. Do not cut the hose yet. 4. Connect Water Inlet Hose to water supply: Now we will make the connection to your plumbing. We have provided hardware for two types of connections. NOTE: Pick whichever one is most appropriate for your current setup. If both options are available, we recommend the Sink Adapter because you can leave the hose installed permanently, whereas this may not be the case for the Garden Hose Adapter. [NOTICE] DO NOT cover the pump box. DO NOT place the pump box in a confined area. DO NOT use Reverse-Osmosis or Deionized water, it will destroy the machine. In the Plumbing Kit you will find a Sink Adapter, which is a “Tee” connector compatible with most common under sink fittings. 2. If you have a faucet attached to that line, turn it on to drain the line and confirm that the water supply is fully turned off. 3. Select an appropriate wrench to loosen the connection of the water supply you have chosen. A common adjustable wrench will work in most cases. 4. Unscrew the existing sink connector from the water supply. 5. Screw the Sink Adapter into the water supply. 6. Reinstall the faucet supply into the threaded side of the Sink Adapter. 7. Cut the end of the Water Inlet Hose with a sharp box cutter, making sure to leave enough slack in the hose. DO NOT use scissors, as they will deform the end of the Water Inlet Hose. 8. Push the hose into the Sink Adapter. 9. Make sure the valve on the Sink Adapter is open. 10. DO NOT turn on the water supply valve yet. 11. Move on to Hose 2: Install the Water Drain Hose. Make sure to fully seat the hose in the connector. You will feel a level of resistance (the seal) that you need to push past until the hose is fully seated in the connection. A total of about 1” of hose should be inserted into the connector. RECOMMENDED: Before cutting any lengths of Water Inlet Hose we recommend leaving enough slack to create a small loop in the line near the connection point. This allows extra slack to reposition in the future and relieves the joints to prevent leaking. [NOTICE] If this location has separate hot and cold water supply lines, install using the cold supply line. NEVER use hot water. Hot water will damage WAZER. These threads are often found in commercial buildings, garages, and workshop sink faucets. In your Plumbing Kit you will find the Garden Hose Adapter. 1. This Garden Hose Adapter will thread into a garden hose or sink faucet. 2. Install the Garden Hose Adapter and make the push connection with the Water Inlet Hose. 3. DO NOT turn on the water supply valve yet. 4. Move on to Hose 2: Install the Water Drain Hose. RECOMMENDED: Before cutting any lengths of Water Inlet Hose we recommend leaving enough slack to create a small loop in the line near the connection point. This allows extra slack to re-position in the future and relieves the joints to prevent leaking. WAZER outputs a significant amount of water during cutting. For this reason, the Water Drain Hose must be connected to your drain before operation. 1. Connect the Water Drain Hose to WAZER Main Unit. In your Accessory Kit, you will find a Water Drain Hose (1/2” diameter White Hose). Connect this hose to the Water Drain Hose Connection located in the back-right corner of WAZER Main Unit. Note that the Water Drain Hose Connection swivels for more direct routing. 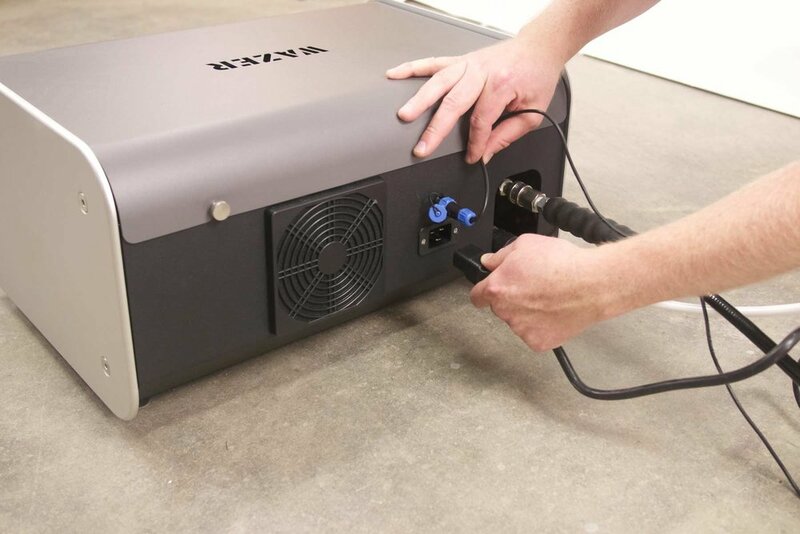 You may choose to untwist the twist tie holding the Signal Cable and Power Transformer wire to the back of WAZER Main Unit for better access to the Water Drain Hose Connection and to the High-Pressure Hose Connection. 2. Route the Water Drain Hose. This will likely be similar to your Water Inlet Hose routing. 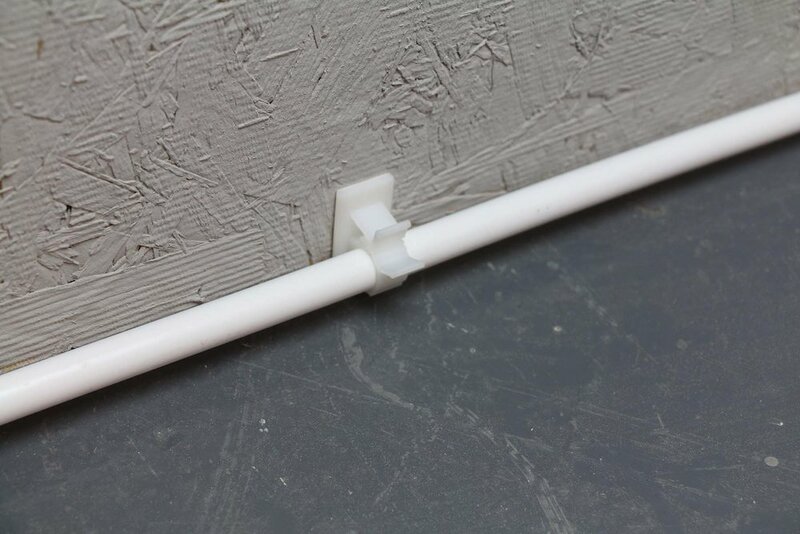 Zip tie the hose to other plumbing or use the provided wall anchors; avoid rough or sharp contact points. 3. Secure this to the drain. It is OK for the Water Drain Hose to empty into a basin, as long as the hose is well-secured. Make sure the drain is no more than 4 feet above WAZER. Note that WAZER outputs a significant amount of water while cutting. An unsecured hose can quickly spill large amounts of water. Make sure you are draining waste water appropriately. The water drained from WAZER is partially filtered. There will likely be some Used Abrasive and Material in the drained water. 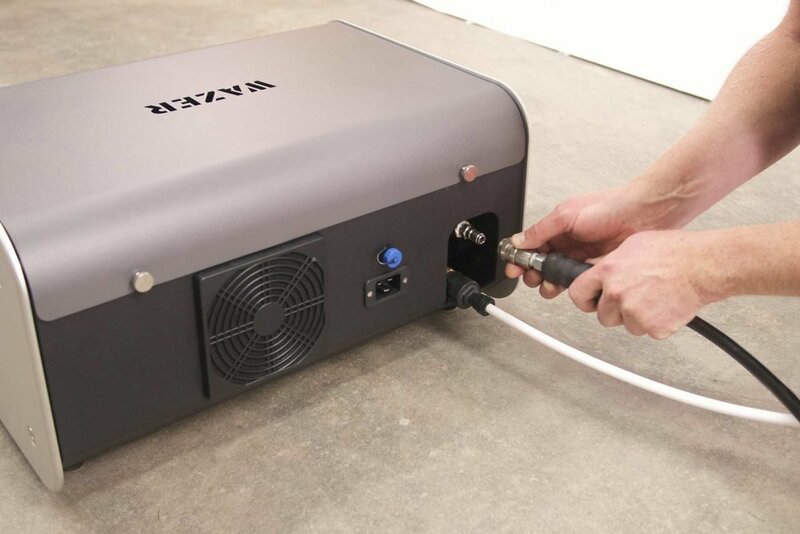 The High-Pressure Hose transfers high-pressure water between WAZER Main Unit and the Pump Box. This hose is 5 ft. long. Ensure that it reaches between the two units without inducing stress at the joints. Do not route this hose in a way that will cause abrasion, pinching, or puncture. In particular, check for pinching between your desktop and the wall. This hose has Quick Connect fittings attached at either end. To make the connection, pull back the collar and then push the female end firmly into the High-Pressure Hose Connection, making sure to seat the fittings completely. 1. Connect one end of the High-Pressure Hose to the High Pressure Hose Connection located on the back of the Pump Box. Ensure the fitting is fully seated and the collar has snapped forward. Pull on the hose to be certain of the connection. 2. Connect the second end to the High-Pressure Connection located on the back corner of WAZER Main Unit. Ensure the fitting is fully seated and the collar has snapped forward. Pull on the hose to be certain of the connection. Make sure the Pump Box is in a location that does not cause added stress to the High-Pressure and Water Inlet Hoses. Make sure the High-Pressure Hose does not bend too sharply coming out of the back of the Pump Box. 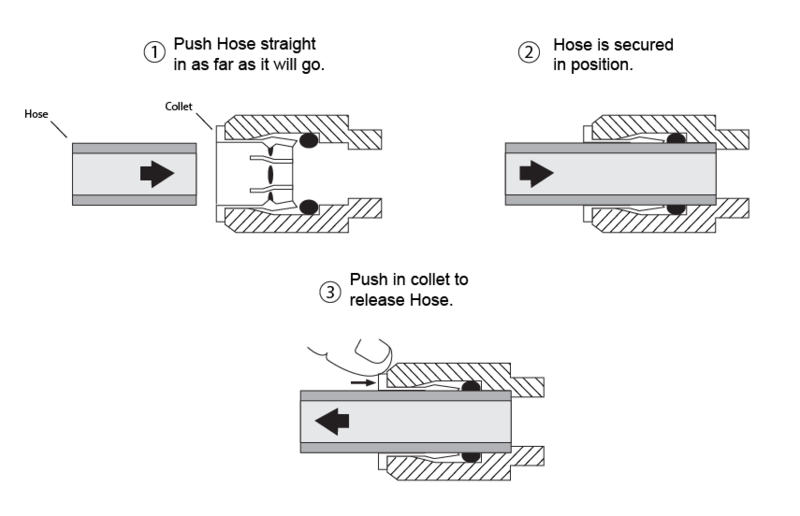 If there is a sharp bend, the High-Pressure Connections will experience uneven stresses. This stress will cause the internal O-Ring to fail and release high-pressure water. If there is a leak or things get wet that likely shouldn't have, turn everything off, wipe it down, and LET IT DRY overnight before seeing if anything was damaged and is still working. to the hose farther downstream. Make sure the location of the On/Off Valve is easily accessible so that users can easily turn it on and off. Ensure that the water supply to the Water Inlet Hose is turned off. Cut the Water Inlet Hose with a sharp box cutter in the location you would like to place the On/Off Valve. It should be at least 12” from any other connectors. This slack prevents stressing the connectors when someone manually turns the valve on or off. Insert both ends of the cut hose into the On/Off Valve. [NOTICE] Make sure to fully seat the hose in the On/Off Valve. You will feel a level of resistance (the seal) that you need to push past until the hose is fully seated in the connection. A total of about 1” of hose should be inserted into each side of the On/Off Valve. It is important to shut the Water Inlet Hose off whenever WAZER is left idle for prolonged periods of time; not doing this could lead to a massive water leak or damage to the unit. The valve also acts as a quick access safety mechanism to help limit damage in the event that an accident occurs. The On/Off Valve is OPEN when the handle is parallel with the hoses. The On/Off Valve is CLOSED when the handle is perpendicular to the hoses. Inspect all water connections. Make sure every connection is well-seated and matches the descriptions in this User Manual. Turn on the water supply to the Water Inlet Hose, and turn on the On/Off Valve. Inspect every point in the connection for leaks. Leave the water supply on for a few minutes and recheck the connections for any slow drips. Shut the On/Off Valve before continuing on to the next section. This is a cable that is permanently attached to WAZER Main Unit and needs to be connected to the back of the Pump Box. Untie the twist tie holding the Signal Cable to the back of WAZER Main Unit. NOTE: The WAZER Main Unit Power Transformer wire is bundled with the Signal Cable. Set this aside for later. Unscrew the blue Cap on the Pump Box connector. Line up white dots on the connector. We suggest routing this wire along the High-Pressure Hose using zip ties. In the Setup Kit you will find a Pump Box Power Cable. Attach this from the connector on the back of the Pump Box to a wall receptacle. 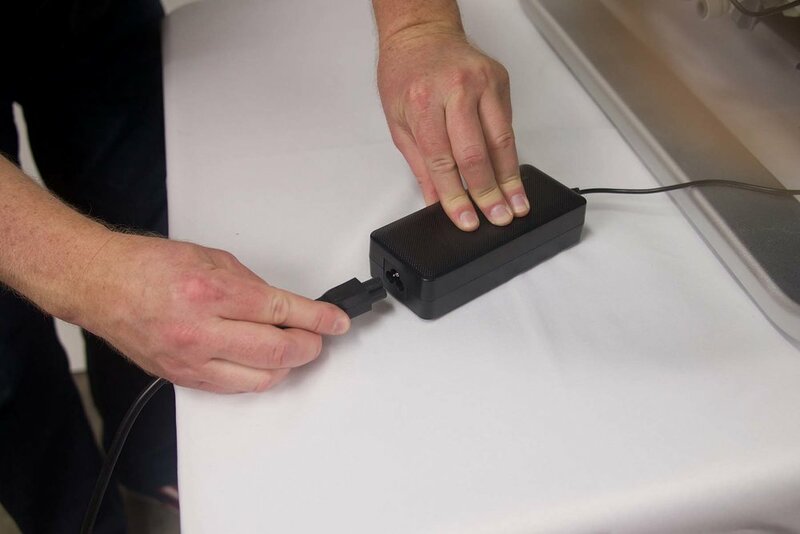 The Pump Box requires 100-120 VAC / 60 Hz (U.S.) or 220-240 VAC / 50Hz (International) and has a current draw of about 15 Amps (U.S) or 9 Amps (International). Most home outlets run on a 15 Amp (U.S) circuit. If you intend to run the Pump Box in your home or office, it will need to be on a dedicated circuit with no other electronics running. Machine shops typically run 20 Amp (U.S.) circuits. If your shop has a 20 Amp Circuit, you can run the Pump Box and other tools off the same circuit simultaneously. [NOTICE] Check your machine power setting before connecting to your local grid. 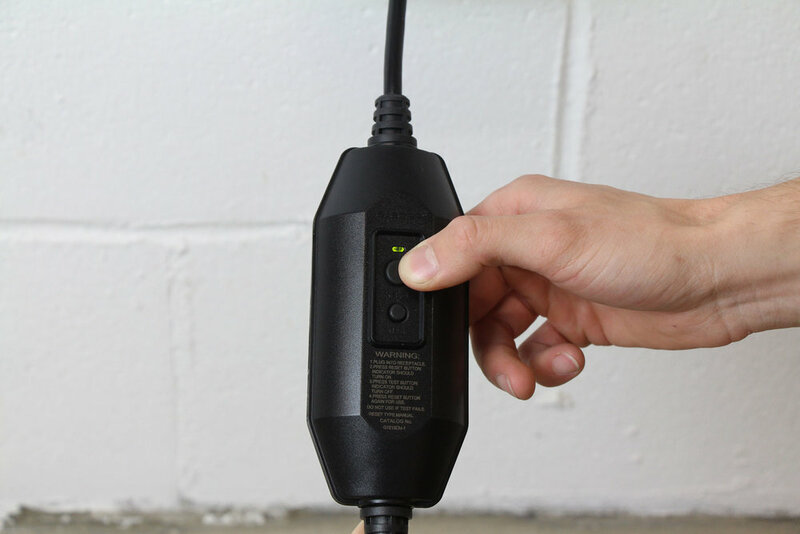 When you plug in the Power Cable, you must press the RESET button on the GFCI. Look for a green light to turn on. WAZER runs on 24 VDC, which requires a Power Transformer. You will find the Power Transformer adapter taped to WAZER; remove the Right-Side Access Panel for better access. The WAZER Power Cable for the Power Transformer can be found in the Accessory Kit. WAZER has a current draw of 1 Amp. If you are running the Pump Box off a 15 Amp Circuit (U.S.), you will need to run WAZER off an entirely separate circuit. Make sure to plug the WAZER Power Cable into an outlet on another circuit. If you are running the Pump Box off a 20 Amp (U.S.) circuit, you can run WAZER and Pump Box off the same circuit. [NOTICE] When WAZER is connected to power, but turned off, there should be no moving parts or emitted lights. If you remove the Right-Side Access Panel and observe the Control Box, the top left LED should be on. WAZER will not be making any noise. Ensure that you place the Power Transformer in a location free of drips and potential leaks from WAZER. DO NOT place the Power Transformer under WAZER. Find a good location on the tabletop next to WAZER. Because the electronics will be operating around water, both power cables have integrated GFCI protection. Do not attempt to use any cables that are not GFCI protected. DO NOT attempt to use any other Power Transformer other than the one included by WAZER. If the provided cables are not long enough, it is acceptable to use a heavy duty extension cord only if it is verified for a 15 Amp (U.S.) or 9 Amp (International) current draw. In the event of a malfunction or breakdown, grounding provides a path of least resistance for electric current to reduce the risk of electric shock. This tool is equipped with an electric cord having an equipment-grounding conductor and a grounding plug. The plug must be plugged into a matching outlets that is properly installed and grounded in accordance with all local codes and ordinates. Improper connection of the equipment- grounding conductor can result in a risk of electric shock. If repair or replacement of the electric cord or plug is necessary, do not connect the equipment-grounding conductor to a live terminal. Reduce the risk of unintentional starting. Make sure switch is in off position before plugging in. Now that you have completed all the necessary connections, position WAZER and Pump Box into their final locations. 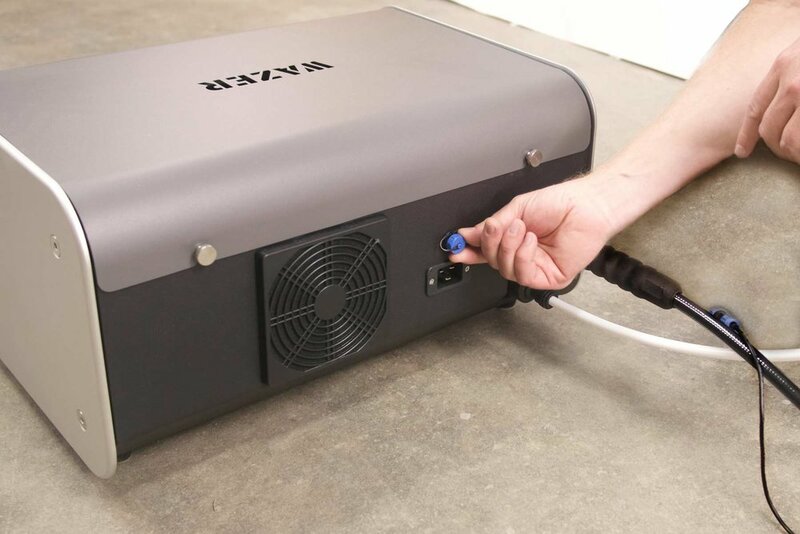 The Pump Box can be slid further under the bench or WAZER Main Unit so that it is out of the way. Make sure to allow for plenty of air circulation around the Pump Box and do not stress the water or Power Cables on the back of the unit. The Wall Anchor helps to ensure the accuracy of the Cut by dampening any vibration you may cause by accidentally bumping into WAZER while it is cutting. 1. Install the Wall Mount Bracket using the provided hardware. The bracket is installed on the back-right side of WAZER (when viewed from behind) with a 4 mm Allen key. 2. Move WAZER into position and mark the wall where you intend to drill holes for the appropriate Wall Mount Bracket. 3. Move WAZER away from the wall to drill holes or install wall anchors. Then, move it back and install the appropriate screws through the bracket. Note that wall anchors for both drywall and concrete are provided. Please install the appropriate hardware. 4. Grab the Nozzle to move it away from the foam block. Moving the Nozzle by hand will not harm the Gantry or motors. Remove the foam block once the Nozzle is clear. 5. If the Rear Tank Cover popped out of place while removing the foam block, replace it before continuing. You should feel it fall into place if correctly positioned. If the Rear Tank Cover is not properly placed, you will be unable to close the Door. 6. There are float sensors that require a stable water level for the Wazer to perform correctly. If no wall anchor bracket is installed, waves in the tank from machine shaking or something bumping into the Wazer can throw the machine off or even trip its emergency shutoff switches. Required for initial WAZER setup! Make sure you Prime the Plumbing to ensure all the air has been purged from the water lines before starting your cut. To Prime the Plumbing refer to Maintenance > Misc Procedures > Priming the Plumbing.